Ken Gray links on his blog to some prototype Bike Arc bike racks in Palo Alto, published in the online edition of the Architect's Newspaper. These are like luxury versions of the vertical bike racks long produced by local company Bike Up. In fact, we don't have to look too far to see some interesting bike rack designs. And as I described in a post earlier this month (Bike Rack Blunders), it's fairly easy for site builders to provide insecure bike parking, despite good intentions. But first let's look at the fancy racks. This one's a bit of a head-scratcher. Designed by VELO-RACK of Montreal, they're installed (or at least they were in 2004) in front of the former Dennis Coolican building, now behind the Amica at Westboro Park. Can you figure out how they work? Think about it. We'll get back to that one later. When I encounter such racks, I park my bike along them, as though it were a fence. 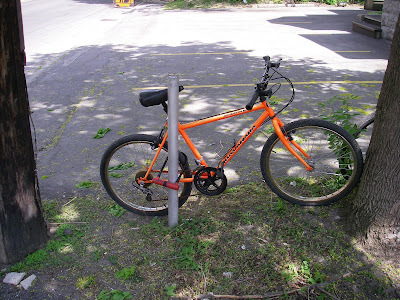 Bike rack design is, however, a very important issue. Not just from an aesthetic standpoint, but from a functional one, too. Many times, bike racks are designed to fit as many bikes as possible into them. But this design only works when they're used as intended, which often isn't how they're used. Then there are racks designed for high yield, but are, again, head-scratchers. I encountered this one outside the Cancer Centre at the Civic Hospital. It's obviously designed to hold a lot of bikes, but how? Like other cyclists, I just hitched my bike to the familiar post at the end of this device and left it at that. Still wondering how that red thing is used? Well there are two arms that stick up and hold the bike like a claw. There's a hole in the middle for you to put your lock through (my lock was too thick to stick through the hole, which defeats the purpose if you need an easy-to-cut lock to hold it secure), which holds the two halves of the clamp together. For more on bike parking, have a look at the article I wrote for CfSC's Better Bicycling newspaper in 2004 (page 9, PDF). Varoius writeups and photos include an illustrated architectural history article by Heritage Ottawa, overhead historical photos at The Ottawa Project, a "blunders" article at NCC Watch, and the obligatory Wikipedia article link. Not too many photos of the interior, though. The Wikipedia article has one photo of the ceiling, but that was taken last July. 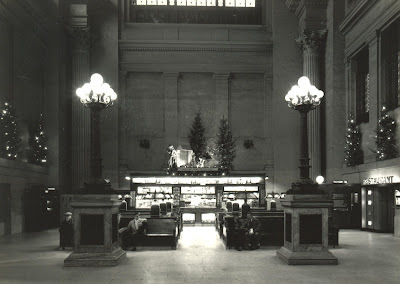 The Heritage Ottawa article has a photo of the interior. But that's all the internet would give, at least for Ottawa's Union station. But there's more. As you can see, the benches and lamp standards were quite ornate; it was definitely a very decadent space. I must say, this was quite a serendipitous treat. The museum seems to be doing more tours of their collection, not just during Doors Open. So go check them out! The infamous Yellow House, which I discussed previously in the post Images of Gladstone, is coming closer and closer to redevelopment. As a recap, 740 and 742 Gladstone, had housed the Pawn-Da-Rosa pawn shop and apartments above. Despite being schedule to be demolished "next month," in July 2008, the City wanted the owner to paint over the graffiti that was on the building. So Gary Stunden*, agent for the building's owner, Ali Shafiei, decided to paint it yellow, partly as a gimmick, and partly to tease the City for doing something as silly as ordering him to clean it up with only a month left until it was demolished. The above photo was taken on July 11, 2008, shortly after the sardonic paint job. The plan is to demolish the building, along with its neighbour, 746 Gladstone, to be replaced with a seven-unit townhouse development to fill the large corner lot. Here's a shot of 746 Gladstone from last September. The porch was removed, and the doors and windows were boarded up and/or painted black. The top window in the attic appears to have been gone. By yesterday, June 25, 2009, both buildings were still there. The yellow house has received a lot of graffiti (and painting over thereof) and the yellow paint has chipped off the large windows at the front. The other house is largely unscathed; a window appears to have been installed in the gap at the top, and a piece of plywood now covers the front window, but it seems that the subtle disguise of the blacking over, coupled with the bright graffiti magnet next door, has spared it from vandalism. Even the rear of the house, though the windows are boarded up, appears unscathed, with the upper-level windows unbroken. Tall thistle weeds in the garden help. The Cambridge Street side of the house has weathered--it's had a lot of character added to it in the last eleven months. You can see spots where graffiti tags cover yellow splotches that painted over previous graffiti. But also a sign of hope: the black and white sign suggests that development may finally come to the site. At the June meeting of the Dalhousie Community Association, plans were circulated for the site. 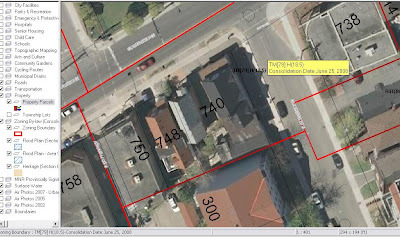 For reference, here is a screenshot from the City of Ottawa's eMap application with 2007 aerial photos. We can see that both houses are on a single lot, marked 740 Gladstone. We can also see the former garage. The zoning is Traditional Mainstreet with a height limit of 18.5 metres. The site plan is to demolish the two houses and replace them with a townhouse-style development, with seven 12-foot-wide townhouses facing on Cambridge Street. The one closest to Gladstone will be a trapezoid-shaped unit (16'-3" at Cambridge, 10'-0" at the rear) following Gladstone's bend, addressed 744 Gladstone (interesting choice, since the two existing buildings are 740, 742, and 746), and will have ground-floor retail. It looks like all the units will have parking in the rear, accessed from Gladstone, and will be built above the parking. The fronts, on Cambridge, will have little gated garden spaces, encroaching slightly onto the sidewalk right-of-way, but greatly adding to the character. According to the City planner in charge of this application, the application is on hold pending completion of a Phase II Environmental Site Assessment. I was very annoyed to discover that very early on in taking photos, I got a fingerprint on my lens. Luckily, many of the images were salvageable. If you haven't already, please pay a visit to the Friends of Lansdowne Park website and sign their petition calling for an open design competition for Ottawa's largest public space. On Wednesday, I had the pleasure of attending the opening of the Bytown Museum's summer exhibition: Justin Wonnacott: Somerset. The exhibition is quite a new approach by the museum, which has traditionally focused on the early history of Ottawa (formerly called Bytown). Here's a description of the exhibition which greets you as you come up to the second floor (pardon the poor lighting; I wasn't using a flash). Justin has taken many, many photos of Somerset street over the last few years and used them to compile a visual record of the street for time immemorial. You may recall his blog, which was on hiatus for a couple of years. 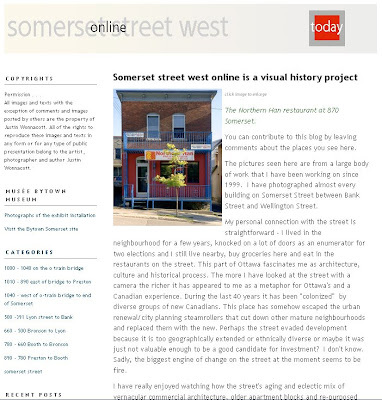 It's been revived, and you can see many of his photos there, as well as on his Flickr and Facebook, from the project website, www.Somersetstreet.ca (www.ruesomerset.ca en français). Plenty of great info there. The opening was a great event. Lots of people turned out, and free beer was provided by Heritage Brewing, which recently returned to central Ottawa (near Carling and Clyde), serving beer in its trademark stubby bottles. ("Real ones," said Ron, the brewer. Not those knock-off screw caps!). I had a lengthy chat with Ron, who says the brewery enjoys receiving tour groups. One hundred percent of the Bytown Museum's funding comes from the City of Ottawa (meaning they suffer from the annual chronic funding problems facing Ottawa's cultural community), yet over 80% of the visitors are from out of town, which means that Ottawans are missing out on this gem of our history. Let's hope that the Somerset exhibition initiative is the start of a new trend of more local visitors. The exhibition is open until November 30, 2009, and the museum is open daily from 10am to 5pm, to 8pm on Wednesdays--so you have no excuse not to go! Justin's exhibition and blog have inspired me to post more of the things I photograph. I just need to find the time! The number and closeness of the over abundance of highrise condos in the downtown core is stifling, with a severe lack of parks and green spaces where communities can gather. On the right, Pat Hutchison's My Church is simply labeled "Spiritual Home". The sprightly older genetleman on the right in this photo was featured in a pair of photographs holding a bottle of school glue to "fix" a rataining wall damaged by tree roots. It was a fun event, and a great way to learn about concerns people have in other neighbourhoods--particularly people who tend not to participate in such discussions, such as younger and lower-income populations. 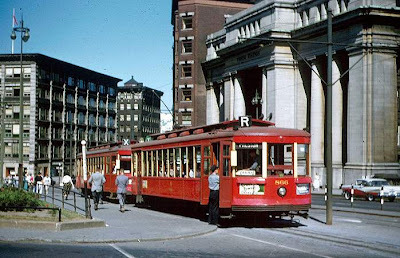 Common themes were pride in one's neighbourhood, pleasant experiences with buses, and complaints about garbage, lack of greenspace, pedestrian and wheelchair access, and spaces to play. On Tuesday, the City of Ottawa's Planning and Environment Committee (agenda) will be considering an Urban Tree Conservation Strategy, including the implementation of a by-law to protect distinctive (i.e. large) trees on private property within the urban boundary of the city. Especially with the Emerald Ash Borer bug coming to take away our Ash trees, the City has been planting lots of trees, and wants to minimize the unnecesary removal of other types of trees. After all, it takes decades (or centuries) for trees to grow, yet they can come down in just minutes. This is the third and final part of the series on the former Ottawa City Hall at 111 Sussex drive, in anticipation of Doors Open Ottawa this weekend. Today we'll look at the north-east part of the 1993 addition, which is built right up to the Rideau River. From the photo above, turn left. You'll see the ramp heading down to the parking garage, and a well-hidden path going along the river. In contrast to the West side of the addition, this side has turret-like bulbouts into the water. In the background, we see Unity Tower, and a span of the Minto Bridges along Union street. Looking back up at one of the turrets, we see the pathway coming down from Sussex. The pathway actually stretches within the outside wall of the 'turrets', but is open to the elements. To add to the surrealism of, there are gaps between the bulbouts with stairs leading down into the water, which is only a couple of feet deep off the building. At the back of the north-east side is Unity Tower, which is an architectural feature criticized for having no function. On a nice day, though, the clouds and reflection in the glass make for a good photo. When I came back later that evening, the water on the Rideau was crystal clear. Here we can see the full reflection of the tower, as well as a couple of the bulbouts and another part of the bridge. And that's 111 Sussex! Go check it out for yourself during Doors Open Ottawa this weekend (of course, you can check out the exterior features at any time). I'll leave you with a photo of Sussex drive reflected in the Rideau River, with the French embassy on the right.